You have added Night Garden Floral Print Mini Dress into shopping cart. We love the floral print against the dark background of this dress! The Night Garden Floral Print Mini Dress is lined only at bust. It has a deep plunging neckline with boning for structure and a padded bust for extra support. It has at attached asymmetrical wraparound skirt. The straps are adjustable and extend to the back of the dress to lace-up; this allows adjustment for fit. It has a beautiful oversized floral pattern in ivory, pink and gray against a black background. A hidden back zipper completes this dress. This dress is perfect for date night. Details: Lined at bust. Padded bust. Hidden back zipper. 100% polyester. Cold hand wash only. Cool iron. Do not soak. Do not tumble dry. Small measurements: Length from top of bust to hemline: 31”. Bust: 32”. You have added Night Garden Floral Print Mini Dress into Wishlist. 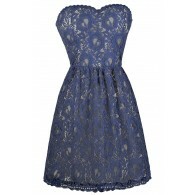 You have added Night Garden Floral Print Mini Dress for Stock Notification. You have set Night Garden Floral Print Mini Dress as a loved product. 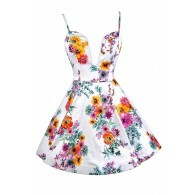 You have removed Night Garden Floral Print Mini Dress as a loved product.